At this point of time there are about 130 families with the surname Durben living in Germany. In the United States are more than 160 families and a few are living in Great Britain. Apart of this alterations and transformations are existing like Durbin or Durwen. 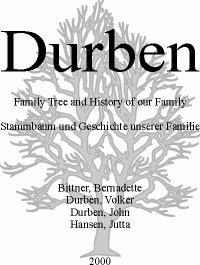 All presently known roots of the Durben family derive from Germany in the region of the Eifel. It is assumed that all these Durben families derive from an one and only originator. For more than 30 years does Bernadette Bittner born Durben, genealogy research of the Durben family tree. Through this she, as an descendent of a family which emigrated to America in 1856, managed to construct a bridge to the birthplace of her ancestors, the Eifel. Since 1997 Volker Durben collects and organizes these research results in a database, extends the database with conclusions of other genealogists or his individual researches. Further John E. Durben and Jutta Hansen born Durben also have a portion on named project. This year a completely revised version with a lot of new information was published which was presented at the Family reunion in Nickenich: In the future Amendments to this book will be exhibited at this location.